Lights! Camera! Action Verbs and Linking Verbs! Hey guys! Welcome to this video on action verbs and linking verbs. So, perhaps you’ve learned what a verb is, but you were unaware that there were different types; or perhaps you’ve heard that there are different types of verbs and you’ve come to see what all the mess is about! Whatever the case, you’ve come to the right place. To start, let’s define action and linking verbs. Action verbs are pretty straight forward, they tell of an action; like sweat, crawl, throw, laugh, and so on. Linking verbs connect or ‘link’ a sentence’s subject to all the other details pertaining to the subject. A linking verb does not describe an action. The state of becoming. This includes words l ike: will become, will have become, to become, become, becomes, has become, became, have become, had become, and so on. The state of seeming. This includes words like: had seemed, have seemed, has seemed, to seem, seems, seemed, seemed, was seeming, were seeming, is seeming, are seeming, and will seem. Those were the three forms or types of words that are always linking verbs. The most popular from all the linking verbs that I mentioned above are the linking verbs from point 1, the state of being. Now, the examples I gave you of action verbs and linking verbs, up to this point, have been pretty straight forward. But as we all know, most things are not THAT simple. There always seems to be that little exception to the rule that creeps in and makes something, that was once so simple, all the sudden very confusing. Here is that thing: There are verbs that can function both as action and linking verbs. So, in one sentence it may be functioning as a linking verb, and in another that same word may be functioning as an action verb. However, if one of your “linking verbs” has another verb with it then that linking verb is no longer a linking verb. Joe is climbing the fence. Now, in this sentence “is” is not a linking verb, because there is another verb that is describing what the subject is doing; so, “is” then is a helping verb. Now, a helping verb, which you may have also heard called an auxiliary verb, is exactly what it sounds like. It helps the main verb of a sentence by giving more insight into the portrayal of time. Another way of saying this is that it helps the main verb form the proper tense. Anyways, to identify these interchangeable linking or action verb words, I have another clue for you. The easiest way to distinguish a linking verb from an action verb is to insert the word “is” in place of said verb. If the sentence is still understandable, then more than likely you are dealing with a linking verb. Now, grow is one of those words that can have more than one meaning. It could be talking about a plant growing, or something becoming. In this sentence grew means became. So, the man became angry. Now, remember “became” is one of our words that is always a linking verb, so we have our answer. We could also check this by plugging in is in place of grew, “The man is angry.” It still makes sense! 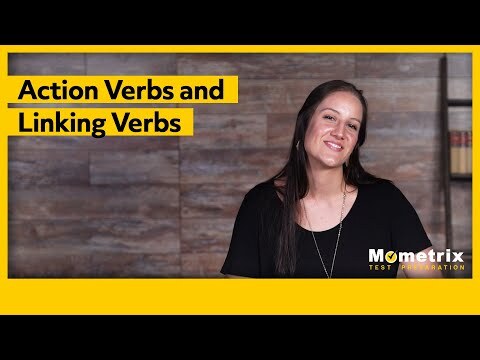 I hope that this video on action verbs and linking verbs has been helpful to you. If you enjoyed it then be sure to hit the like button, and subscribe to our channel for further videos.